An African violet has soft, velvety leaves and flowers that range from deep purple to white and anything in between, depending on the variety. African violets need bright light and warm, humid conditions to flourish. 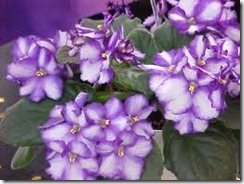 African violets do extremely well in artificial light so they are a beautiful addition to any room. Caring for an African violet can be easy when you follow these simple steps. Water the African violet. You can water it from the top by pouring room temperature water into the top of the pot. Avoid getting the leaves and flowers wet and drain excess water from the drip pan. You can water the African violet from the bottom by placing the plant into a container with one inch of room temperature water in the bottom. When the surface soil is moist, remove the plant. Do not let it sit in the water or it will damage the roots. Feed the African violet. Houseplants should be fertilized every three to six months. A water-soluble fertilizer containing nitrogen, phosphorus and potassium is best. There are also commercial fertilizers that are specially made for African violets. Follow the directions on the package for the amount of fertilizer to use. Apply the dissolved fertilizer from the top and discard excess water from the drip pan. Prune the African violet. Keep your plant pruned and it will continually have new growth. Remove three leaves monthly from the bottom row. Bend them to the side and they should snap right off at the base, leaving no stub. You can gently brush leaves with a soft brush, such as a soft tooth brush to remove dust and dirt. Pick off the wilted flowers to promote the growth of new ones. Re-pot the African violet occasionally. Only re-pot the plant when the plant is completely filling up the present pot. African violets tend to produce the most flowers when they are slightly root bound. Control pests and prevent diseases from affecting the African violet. If you water the plant too much or it does not have proper drainage, it can develop a couple of different conditions. Crown and root rot is when the crown and roots of the plant turn mushy and droop. Botrytis blight is caused by a fungus and shows up as spots on the under side of the leaves. If your African violet develops a bug problem, you can use insecticidal soap sprays for mites and most other insects. Mealy bugs require a different treatment. Use equal amounts of water and alcohol and touch each bug with a cotton swab until they are all gone. By using sterilized soil, providing good air circulation and water drainage, removing all dead flowers and leaves, and providing food, water and light, your African Violet will be a beautiful addition to your home. The loss of leaf color along with a reduced growth rate could indicate the need for fertilizer. Keep the leaves and flowers dry when you water the African violet and make sure it has good drainage.